A: How would you describe yourself in one word? B: So very cold. Did you like that Sheela na Gig carving I gave you? B: I’m glad you liked it very much. A: I was being sarcastic. It’s disgusting. B: So was I. I’m distinctly not glad you like it. A: Does your foot still hurt? A: No, I meant after the birth. B: So you meant after the accident? B: I’m not mocking you. I’m just mocking your phobia of things that touch water by three sides. A: You do not scare me. B: I am not a peninsula, so I am not surprised. A: I also have a great pain in my foot. In future, I must be more careful with the umbrella. B: Even when it rains? A: I was talking about my foot, not my umbrella. A: It’s so painful, I will have my funeral next week. B: I will bring balloons. B: All funerals have balloons. Black ones, obviously. A: For every balloon you provide, I’ll hand out a needle to a mourner to pop it. B: Ah, but I’ll hide something inappropriate inside the balloon that’ll only be released if popped. A: They can throw it away. B: Not if it’s carbon monoxide. A: Carbon monoxide is solid in-between -205 °C and -192 °C. Then it can be thrown away. B: Won’t that be cold? A: We’ll just have to wear warm coats. C: I’m not a part of this conversation. A: Last night, I had a dream where I drowned in pools of my own blood. I don’t know what itvmeans; I just know that it’s not good. B: If you include Antarctica, there are only six consonants. Oh, not consonants, I meant compliments. A: I’ve heard it lovely there. B: I’ve heard it’s lonely there. 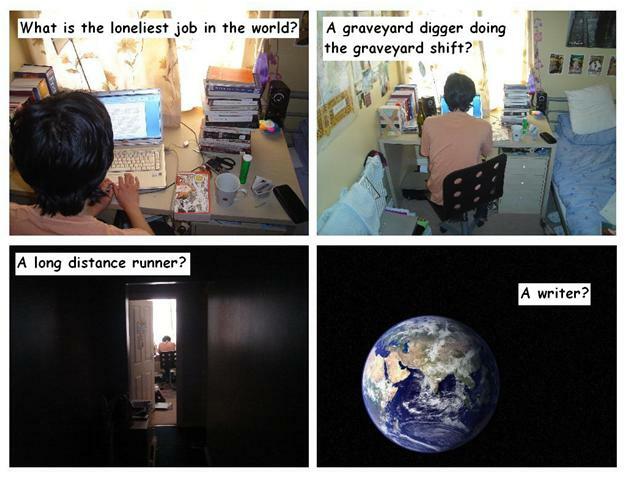 A: Graveyards aren’t lonely. It’s a party with dead people who can’t leave. B: Several years from now, there’ll be so many deaths that the whole planet will be a massive cemetery to fit everyone. I read it in a newspaper. A: Newspapers are false. I read that a scientist chemistrated that the best part of a roller coaster is going down at a terrifying speed because everyone subconsciously wants to die. B: But that sounds true. A: Then why is everyone so relieved at the end of the journey? B: Because the drive home from the amusement park is the Afterlife, and the traffic jam is Limbo. A: No, because I made it all up. Even about funerals having balloons. B: But I’m the one who said that.